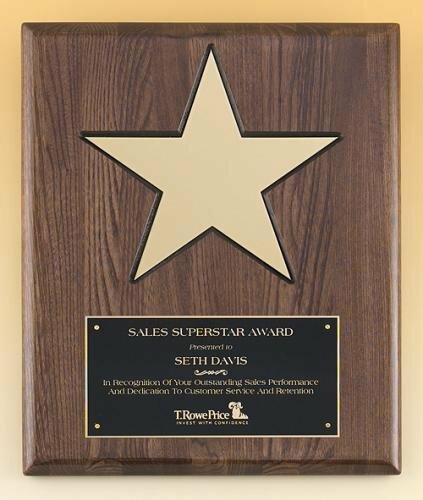 Rosewood Piano Finish plaque, gold Florentine shooting star accent engraving plate. The same production techniques used to give expensive grand pianos their glossy look is available as a recognition award. Over six layers of lacquer are hand applied and polished to create our plaques.Individually boxed. Solid American walnut plaque with a black brass plate and black silk screened border. Individually boxed. Walnut stained piano finish plaque with leaf design plate. The same production techniques used to give expensive grand pianos their glossy look is available as a recognition award. Over six layers of lacquer are hand applied and polished to create our plaques. Individually boxed.